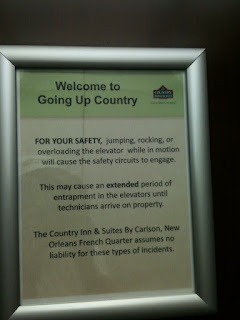 Can you imagine living in a place where hotel elevators need signs like this? I'm out of town for the weekend and feeling much improved. I often read rave reviews about running out of town: new sights! new routes! revitalize your running! Something must be wrong with me, because I do not agree with this. New routes are great, sure, but the miles seem to creeeeep by when I'm out of town and my runs feel as though they take forever. I know that were I to attempt one of those "just see where the run takes me" jauns, I would be back in my hotel in 10 minutes, flat. But not today. I had been tipped off by a local friend that the thing to do was to run down the trolley tracks on St. Charles Ave., where you could travel for miles of great running. I only wanted to do a short run, an "Are you there legs? It's me, Tracy" sort of wake-up run in preparation for attempting a long run tomorrow. I'm hoping to jump right back into my training schedule, but I'm nervous about 10m tomorrow. My run today was my first in well over a week, so I'm just going to head out tomorrow and see how it goes. Back to today's run. It started most inauspiciously, hours before I even put my shoes on. We had an 8am flight this morning, which meant waking up at 5am to get ready for the 6am bus to the airport. Combined with a 1am bedtime, I was tired. I couldn't sleep on the flight because, well, I can't sleep on planes (and Blake Lively was on my flight!). We got here to find that we could not get an early checkin at our hotel room, meaning we had 4 hours to kill, so we headed out to get a bite to eat and some coffee. By 2pm we were in the room and taking an amazing, wonderful 3 hour nap. When I got up, it was already 5pm and the sun was beginning to set. I don't like to run after dark. Technically that's not true: I do like how the absence of light changes and amplifies the physical sensation of running (is that just me?). I feel more vibrant and alive in the fading light. But, I also feel less safe, and in an uncertain city it's not a risk I like taking. Thus the short run. On top of that, my Garmin could not pick up any satellites. It took more than 10 minutes to get an initial signal, and the signal kept dropping off for the first half or so miles. Which meant an incessant and obnoxious beeping because I don't know how to set my watch to not do that. I was ready to throw the thing in the lake - which I was luckily not near. Still, the run was glorious. About a mile in the GPS problems let up and I realized that there were enough people out to make the route perfectly safe. It was lovely and I only had one near miss getting hit by a trolley car. And running in shorts and a t-shirt! Glorious! It will be spring in New York soon enough and then soon after I can start bitching about the heat, but until then, this was beautiful. Happy evening to you, too.